Gregor Johann Mendel was the first to visualize a gene as a discrete, stable particulate unit of inheritance in 1865. He called it a factor and postulated that the offspring receive some specific factors from their parents which make parents characters to appear in the offspring. The term “Gene” was introduced by Johansson in 1909 for a unit of heredity located at a specific site, the locus, in a chromosome. Classical genetics established that the genes control the inheritance and expression of characteristics in organisms. This definition of gene became inadequate in view of the biochemical research of the 1950s and 1960s. A gene is present as a segment of DNA molecule on a chromosome. The new biochemical research led to the formulation of a new concept of the gene. According to this, a gene is a segment of DNA molecule which serves as a unit of function. The unit of function may code for a polypeptide chain acting like a complete simple protein, or a polypeptide subunit of a complex protein, or a tRNA, or rRNA, or it may be involved in regulating the activity of other functional units in the DNA molecules, or some other protein-based cellular molecule. In the prokaryotes, the genes are located in the pro-chromosome (nucleoid) that lies in indirect contact with the cytoplasm. In the eukaryotes, the genes lie in the chromosomes which are isolated from the cytoplasm by a nuclear envelope. A gene consists of a limited number of deoxyribonucleotides pairs arranged in a unique sequence. Genes can mutate i.e. can undergo the change in base pairs and a gene can recombine with a homologous site on another chromosome. A gene is a stable entity but is subject to occasional change in sequence i.e. mutation. When a mutation occurs, the new form of the gene is inherited in a stable manner, just like the previous form. A gene does not function autonomously. It relies upon other cellular components for its perpetuation and function. Also Read: Personal Genomics: Gene Sequencing & Analysis in India. All the genes do not play the same role, or all genes are active all the time. With regard to their role and activity, the genes are of the following types. Certain genes are constantly transcribed (expressed) in all cells because they code for the products which are constantly needed for cellular activities, such as glycolysis, necessary for sustenance. These are called constitutive or housekeeping genes. Many genes remain inactive and express only in certain cells when the product they code for is needed. They are termed non-constructive genes or luxury genes. Protein-coding Genes: These encode mRNAs which in turn code for proteins. Polyprotein- Coding Genes: This encodes more than one protein per gene. Non-protein-coding Genes: These encode for snRNAs, rRNAs, and tRNAs. They are tandemly repeated in the chromosome. A regulator gene controls the transcription to structural genes by producing a repressor protein. An operator gene acts as a switch to turn on or off the transcription of structural genes as the cell requires. A promotes gene marks the DNA site where the enzyme RNA polymerase binds and the transcription of an RNA by structural genes starts. A terminator gene marks the site where the transcription of RNA by structural genes staps. Eukaryotic genes have introns, which are not translated between segments and the exons, that are translated. Such genes carrying genetic information in pieces rather than in a continuous stretch are called split genes. In general, the introns of split genes are longer than the exons. The introns are removed early in gene expression (during mRNA processing). A few genes in certain bacteria and animal viruses are known to code for two different polypeptides. Such genes are termed overlapping genes. For example, the complete base sequence encoding a protein is contained within the gene which codes for an entirely different protein. The two different proteins are synthesized as ribosomes move along the mRNA chain in two different reading frames. This mechanism for the compression of genetic information is simply remarkable and may be widespread. The spacer DNA consists of sequences that lie between the transcriptional units of DNA. They are not transcribed into RNA. They are also called non-transcribed spacers. Also Read: 11 Amazing Facts about DNA You didn’t Know. Genes play a crucial role in cells. They code for proteins, structural as well as functional, to control phenotype and metabolism and also code for RNAs essential for protein synthesis. Genes regulate transcription to generate proteins whenever they are required. They are an important part of the genetic material, the basis for inheritance. Genes undergo mutation and recombination to help in evolution and also contribute to reproduction through replication. Snustad, D. Peter, and Michael J Simmons. Principles Of Genetics. Hoboken, NJ: John Wiley & Sons, 2010. Print. D. Watson, James et al. Molecular Biology Of The Gene. 5th ed. India: Pearson Education Inc., 2009. Print. Weaver, Robert Franklin. Molecular Biology. Boston: McGraw-Hill, 2005. Print. Genetics Home Reference. (2018). 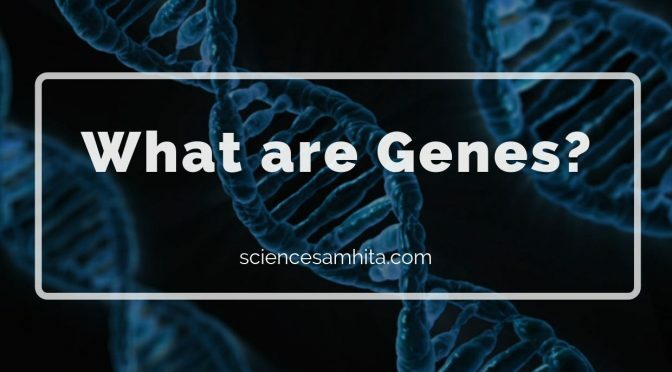 What is a gene?. Available at: https://ghr.nlm.nih.gov/primer/basics/gene. Previous PostBacterial Conjugation – A Primitive form of Sexual Reproduction.Next Post11 Things Parents should know about taking Antibiotics.